When selecting a top for a trash receptacle or recycle bin there are several options to consider. 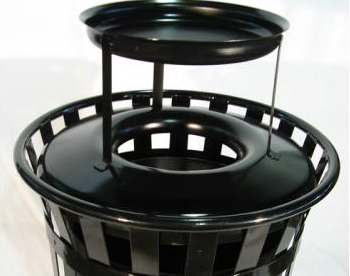 OCCOutdoors offers several types of receptacle tops, rain guards and ash urns on our trash receptacles and recycle bins. The following will detail each style of top and detail the pros and cons of each design. 1. Galvanneal steel spun flat top. This is our bestselling top! Made of 16-gauge spun galvanneal steel and coated with super TGIC powder coat, it offers several great features. The top 66% of the surface is tapered outward so that 2/3 of all precipitation is diverted away from the receptacle opening. The large trash opening is 11 inches in diameter and has a large radius to help catch and funnel the trash into the receptacle. The flat top is attached with a 1/8″ stainless steel cable to prevent theft. 2. Galvanneal steel spun flat top with large rain guard. This has the same great flat top as above with the addition of a heavy 18 gauge spun steel rain guard coated with the same super TGIC powder coat. The rain guard is design to divert precipitation out to the tapered flat top, thus eliminating all precipitation except what is blowing from the side. The design eliminates most of all precipitation from entering the receptacle yet still has large very accessible openings for trash. The flat top is attached with a 1/8” stainless steel cable to prevent theft. 3. Galvanneal steel spun flat top with large ash urn. This has the same great flat top as above with the addition of a heavy 18 gauge spun steel rain guard coated with the same super TGIC powder coat. The ash urn has large with great capacity. This design eliminates most of all precipitation from entering the receptacle yet still has large very accessible openings for trash. The ash urn does catch precipitation and must be emptied by either a strainer or the complete top removed and dumped. 4. Steel flat top with large rain guard and removable ash pan. The rain guard is design to divert precipitation out to the tapered flat top, thus eliminating all precipitation except what is blowing from the side. The design eliminates most of all precipitation from entering the receptacle yet still has large very accessible openings for trash. The ash pan is smaller than the larger unit above however is much easier to remove and empty. Both the flat top and ash pan are attached to by cables to reduce theft. 5. Steel flat top with large rain guard and protected removal ash urn. This has the same great flat top as above with the addition of a heavy 18 gauge spun steel rain guard coated with the same super TGIC powder coat. The rain guard is design to divert precipitation out to the tapered flat top, thus eliminating all precipitation except what is blowing from the side. The ash urn or pan is located under the rain guard thus nearly eliminating the pan from filling with precipitation and hiding the unsightly pan of ashes and cigarette butts. The pan is easily removed for emptying. Our ABS (Acrylonitrile butadiene styrene) is a very durable plastic great for indoors or outdoors since UV inhibitors are added to the base material. Our flat tops are vacuum formed with a large O.D. lip and ribs for strength and a textured surface. Pros are the will not rust and very tough and can withstand a reasonable impact without breakage. Cons are they are lite weight so not the best choice in windy conditions. 7. ABS flat top with small rain guard. Out flat tops are vacuum formed with a large O.D. lip and ribs for strength and a textured surface. Cons are they are lite weight so not the best choice in windy conditions all though the steel rain guard does help. The same features as the ABS flat top but with a heavy stamped steel rain guard to reduce precipitation collection. 8. ABS flat top with a small ash urn. The same features as the ABS flat top but with a small ash pan that reduces precipitation. Con the entire top must be removed to dump the ash pan or empty the trash receptacle. 9. LLDPE plastic dome top with door. The door is balanced to close automatically and to keep the maximum precipitation out of the receptacle. The durable plastic material of this dome type comes in several colors to match any of our receptacles and bins, and will not rust or dent like its steel counterparts. It also comes with strap that can be attached to the receptacle to prevent theft and vandalism. 10. LLDPE plastic dome with dual openings. Design to keep the maximum precipitation out of the receptacle. Easy access with two large openings. Durable plastic material will not rust or dent like steel domes. Comes in several colors to match many of receptacles. Comes with strap that can be attached to the receptacle to prevent theft and vandalism. 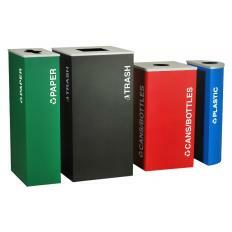 Visit the links below to find the perfect trash or recycling bins and replacement components! Does Expensive always equal Best? The most expensive is not always the best product, nor does it guarantee the best value. At OCC Outdoors, we’re dedicated to engineering lasting products while being mindful of raw material waste. Wasted materials is a surefire way to drive up manufacturing costs. And these manufacturing cost increases are usually passed on to the customer. This is why OCC Outdoors is focused on minimizing waste — it helps keep our production costs low, our product value high, and our prices competitive. Raw materials were not as in-abundance 40 years ago as they are today. There was cheap hot-rolled steel bar . . . and that was about it. But today, it does not take much to make a very good product. You no longer need upwards of 300 pounds of metal or more to support a 1,000 pounds of people. Proper product design, coupled with solid manufacturing, can do more with much less. The bench below weighs 132 pounds and, as the photograph plainly depicts, it can easily support five full-grown men. (These are men from the weld shop who promised bodily injury if their faces were visible.) This bench is not even showing a strain. Visit the links below to find the perfect benches, grills, and trash bins for your outdoor needs! 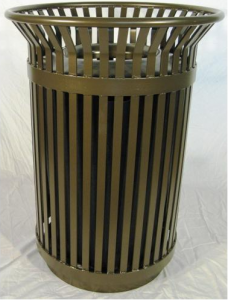 The Colonial 36-Gallon Steel Slat Trash Receptacle from OCC Outdoors. 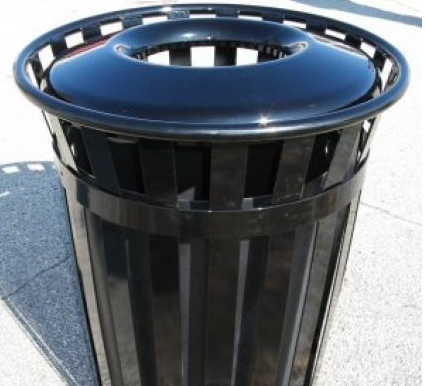 OCCOutdoors designs many products per our customers request and one of our newest is for a trash receptacle design referred to as the “Colonial”. This is a very heavy duty steel slat receptacle designed to compete with other similar products, however as is typical for OCCOutdoors, our cost will be hundreds under our competitors. 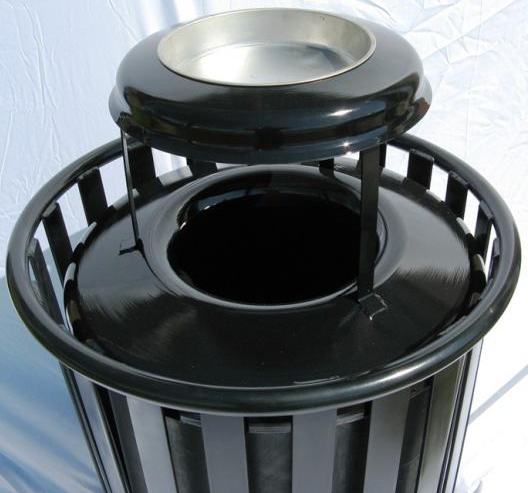 The Colonial, made entirely in Indiana, is a completely steel-welded construction trash receptacle with a galvanneal-spun steel top; two (2) coated 1/8” stainless steel cable anchors; heavy duty rotary molded 36-gallon polyethylene liner and anchor kit. • Design; Centered funnel design to catch trash with the outer surface inclined to eliminate the 60% of precipitation. • Several rain guards and ash urn tops also available. This new trash receptacle has one of the best paint systems on the market today — our Zinc Advantage system! Our Zinc Advantage paint system that includes zinc primer and super TGIC Polyester paint, for additional rust resistance and our Clear Advantage for areas that graffiti is a problem. Protecting the environment — or going “Green” — can be supported in many different ways. But it’s not just strictly limited to recycling. There are ways to support Green efforts in other scenarios: in and around our homes, when we’re driving, just to name a few. Recycling has long been the go-to when it comes to being environmentally sound. Some progressive communities and states even offer incentives for recycling waste. Many are listed on the US EPA site. These are all great programs and should continue to be supported and further supported for continued growth; however, such programs should be taught to our young in order for such programs to grow in support by our cities and states and industrial leaders. More and more communities and companies adding recycling programs to their list of municipal/corporate responsibilities. Outdoor Creative Concepts has supported recycling by making products from recycled materials, like our park benches, outdoor trash receptacles, and from recycled content, working with communities to meet each communities standards and make recycling more convenient and attractive and affordable. See one of the new products developed for a city in New York. There are several ways we can all “Go Green” or help the planet such as driving more efficient cars and driving slower or less. You can see the complete article here: www.tampabay.com/news/publicsafety/article697409.ece. There is also an excellent article on several good gas-saving tips that can be viewed here: www.bargainist.com/deals/2007/08/20-tips-to-save-money-on-gas/. One of our largest consumers of energy is our homes. There are many ways to save energy on our existing homes. And many homes meet the Energy Star ratings (http://www.energystar.gov/index.cfm?c=products.pr_tax_credits); however one way that has not been supported near as much as its benefits and far exceeds any of these in energy savings is earth sheltered homes. Also one of the best sources of information are the books on Earth Sheltered Housing published by the University of Minnesota Underground Space Center. Although the USC is no longer active, their books are still available. Visit the links below and find the best green products made from recycled materials! OCCOutdoors makes every effort to incorporate recycled materials into every facet of the manufacturing process for all of our site furnishings. Unsurprisingly, in today’s ever-growing “Green” conscientiousness, Recycled park benches and trash receptacles are becoming much more popular. OCC research puts recycled steel at the head of the list! According to the American Iron & Steel Institute, annual recoup of steel averages around 68%. The amount of reclaimed steel blended in to a new product varies depending on the steel make process, between 16% and 100%. The Institute of Scrap Recycling Industries states there were 81.4 million tons of steel and iron collected in the United States during 2006. 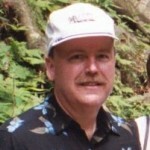 There is up to 74% energy savings using scrap steel when compared to traditional processing of virgin iron ore. And since the use of recycled steel does not impact standards set by the American Society for Testing & Materials (ASTM), Outdoor Creative Concepts has continued their endeavors, increasing the recycled percentage in their products. GO GREEN! And look through all of our products made from recycled material products and find the perfect one for your site!